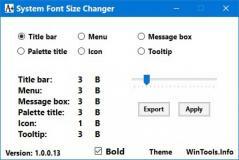 System Font Size Changer is an application that can help you easily access the desktop customization panel to change the text size in title bars, menus, palette titles, icons, message boxes, tooltips, and other Windows UI elements, and applications. The program was created because the font size changing options built into Windows were removed starting with Windows 10 Creators Update. The program is portable so it doesn't need to be installed but it does require the latest version of .NET Framework on your PC to work properly. As soon as you launch System Font Size Changer, the clean graphical layout will display the option to create a backup of the current state of your registry font-related settings. Regarding the options, using them is easy. Once you select an option, mode the slider to the right to increase the font size. Also, you should know that the leftmost point (0) is the default setting. Even if you didn't create a registry backup you can quickly revert to the Windows default font settings by moving all the sliders to 0. System Font Size Changer, doesn't just let you increase the text size, but also make it bold. The interface provides both white and dark themes, and any custom font can be saved to the configuration file. Then, you just need to double-click a .reg file to apply another profile. To commit new changes, you will need to log off and back on. Extend your system's taskbar to the second monitor.